In 1999, Chris Sawyer created a small game about building and managing an amusement park called RollerCoaster Tycoon that was published by Hasbro Interactive. The game was a smash hit, selling over 4 million copies by 2002. The series then received a few sequels, each with a few expansion packs. In 2016, under the ownership of Atari, the franchise got a free-to-play version for iOS and Android developed by Nvizzio Creations. 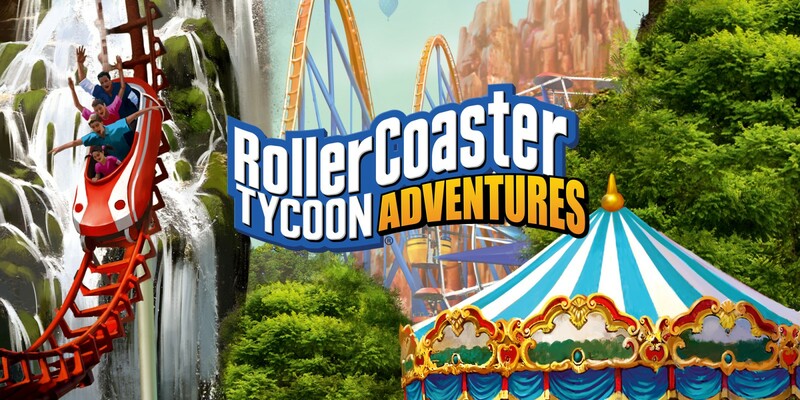 Now, the mobile release has been revised, expanded and adapted for the Nintendo Switch, under the name RollerCoaster Tycoon Adventures, but does the gameplay still hold up? Since the series’ inception, the RollerCoaster formula has remained almost unchanged throughout the years, with just a few new functions such as developing your own roller coaster being added in more recent iterations. Almost all of these functions come back in RCT Adventures with a few small changes to adapt to the modern era and to fit better to the play style in the Nintendo Switch Console. You still have to build new attractions, manage the park’s structure and prices, while also satisfying the clients that attend your park when it comes to prices, food and hygienic and they all still remain as fun and addicting as they were in the original trilogy. This doesn’t mean everything is back or in the same way as before though. Many functions that were simplified, changed or removed in RCT Touch were carried over for this version, which can be very frustrating to those who already played a previous entry in the series. For example, some services that demanded input from the player, such as picking up trash or fixing a broken attraction, are now totally automated and the area at reach from the facility will always be cleaned and the toys fixed. One in particular that bothered me the most is the fact that almost all the interactions with the people that are visiting the park (which was one of the main sources of my entertainment in the original trilogy) were stripped from the game. It is only possible to read one of their many comments about the park and that isn’t that fun. While the gameplay, for the most part, remains consistent and fun, that quality isn’t that well reflected in the visuals. I never expected a huge visual leap compared to what I remember it looking like, but I couldn’t notice almost any noticeable visual upgrades in any of the old attraction. They still look good, but this lack of any substantial visual improvement is what makes me puzzled to why the game features a few other visual problems. One of them is that many objects outside of the park area will pop in and out of view with relative frequency. That doesn’t directly affect the gameplay, but can be a bit distracting and detracts from the overall presentation of the game. However, the one that really affects gameplay is the framerate problems present in most of it. At first, the game is able to run well, but as you add more attractions to the park, it’s not only the people in the roller coasters that keep going up and down. The game even stops completely for a second to process your request to place a new ride in the park. The soundtrack and sound effects end up being not as terrible as the visuals, but not as good as the gameplay, just acceptable enough. You will not get bored by it, as it fits well the pace of the game, making an okay accompanying score. Just don’t expect to remember it after you turn off the game. With regards to controls, the translation of the control scheme is almost perfectly done to both the joystick controller and the touchscreen. If you decide to play with either of them, you are in for an experience similar to the original games, but by being able to use both options at the same time, it is easy to use the advantages of each option and get to the best way to play it. As soon as you start the game, you will have four options to choose from that will provide unique experiences. The first is the tutorial, which features 2 maps that did a quite good job of remembering me about the game’s demands, what was kept and changed and how to do all using the joysticks. The second option is the Adventure mode, a spin on a Campaign mode, in which you take a park throughout its lifespan since the beginning. You will have to do researches to unlock new attractions and make some choices that can affect the development of the park. These create an interesting and addicting dynamic loop that will make you feel satisfied to see your park thrive and playing for just a little more. The third mode is The Challenges, a series of pre-established parks in which you have to complete certain objectives before the determined time. The three levels of challenges available in each provide a more puzzle-like experience that feels fresh amid the other options. It is an interesting mode for those looking to deal with more specific situations that will require much more exact planning. The final option, that is for those who want to express their creativity, is the Sandbox mode, which allows you to build the park of your dream with everything unlocked or having to unlock new things as it goes through. It is a fun mode for those that just want to have a relaxing experience without worrying too much about the park development. Lastly, one of the most interesting gameplay experiences in RCT Adventures is the ability to build your own roller coaster design. This process gives you intuitive controls and many options to manipulate the rails in what almost feels like a second game inside RTC Adventures. It allows your creativity to run wild, but it is suggested that you keep it inside a few parameters, to make the ride more pleasant for the audience. Deciding to follow the parameters can put the player in a few challenging situations where he must decide if he follows his original vision or adapts it for the necessary conditions, which for some can be a interesting additional challenge. RollerCoaster Tycoon Adventures is not without an enticing charm and can be quite fun and addictive, if you are able to overlook all of its visual issues, frame-rate problems and the removal of a few staples of the franchise. If you do like what you have read and are not put off since you want to be able to play RollerCoaster Tycoon on the go and on a bigger screen, then it is a game you will certainly want to consider picking up, but you could always try the mobile release first.